I thought you'd enjoy seeing what the Autumn Leaves yoke and sleeves look like all blocked out. It reminds me of a red, wool Batarang. The lower edge in the picture is the front edge and the yarn ends hanging down are my center back line. You can see the back neck shaping which is very important in keeping a sweater from falling back on you when you wear it. We've all had sweaters and tops that migrate back on us all day, no matter how many times we pull them forward. This is due to a lack of back neck shaping. (Usually that's the cause. If there are extremely heavy embellishments on the back of the sweater, like a real boat anchor, no amount of back neck shaping will solve the problem. In this situation, I highly suggest not purchasing a sweater with a real boat anchor attached to the back. Just a little public service announcement from me to you.) The curvature of our spines at the top of the back, where it joins the neck, will automatically push down on a neckline that is straight across from shoulder to shoulder, resulting in the dreaded Cardigan That Makes You Fidget With It All Day or the highly dangerous Pullover That Tries To Choke You. By dropping the back neck about an inch below the level of the shoulder line, you compensate for the natural curvature of the spine and avoid these terrible sweater conditions. In non-knitting news, Caleb got his expanders put in yesterday and he's not too happy about it right now. He doesn't seem to be in very much pain, but eating is difficult and of course there's a learning curve for all of us as to what he can and can't eat. He's also frustrated because he has to relearn how to eat, how to speak, and how to swallow Advil. His teacher knows what's going on and is being very understanding while he makes these adjustments. I'm hoping that by the first of next week, we'll have most of this worked out and will be eating more than oatmeal, yogurt, and pudding. Does anyone know any good broccoli milkshake recipes? I mentioned that there would be no Mystery Stole this year back in June or so, but since MS4 kicked off about a year ago (whereas the Original MS, MS2 and MS3 all ran earlier in the summer), I have been getting lots of emails and Ravelry messages asking about MS5. To save everyone some time, I thought I'd post again. Mom and I are just too busy this year for either of us to host Mystery Stole. It might happen again at some point in the future, but not this year. 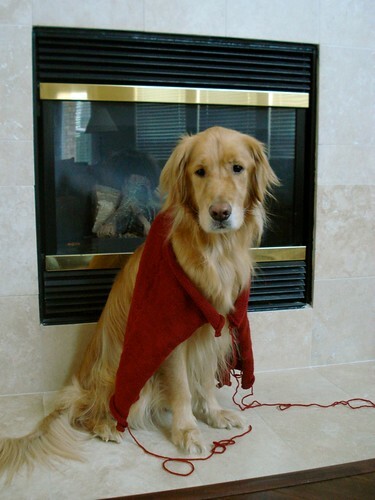 I do appreciate the enthusiasm you all have for Mystery Stole, but neither of us has the enormous amount of time needed to devote to designing and hosting a Mystery Stole. Caleb went back to school this week so Finn and Ramius and I are adjusting to having a quiet house during the day. It seems strange not to be discussing the finer points of Spongebob Square Pants all day long. I've finished my first Monkey sock with the exception of Kitchener stitching the toe closed. As you can see, it has been inspected before I close the toe. It's important to have quality inspection, don't you think? Ahh, here you can see the full sock. Of course the inspector is still keeping an eye on things! We've gotten a lot done over the last couple days around here, but nothing bloggable. Just tying up loose ends before school starts next week. I will add that Caleb sailed through his impressions at the orthodontist without even gagging. The pediatrician also said he's doing great! A few more errands to do today and then maybe I can get more knitting done this weekend. I forgot to mention yesterday, the next couple of days are just crazy around here! I'm not going to blog (really blog, this note doesn't count) until Friday when I've got time to actually sit down and give it the time it deserves. See you Friday! The Cherry Blossom Shawl is Back! Now that I can see what the stitch pattern looks like, and see how repeats stack up on each other, I can read my knitting and catch mistakes before I get more than a few stitches away from them. I've already got two more lace projects lined up in my head after I finish this! I'd also like to do some designing, but I need to get a certain little man back in school so I can hear myself think - without the Spongebob Squarepants theme running through my head. Monkeys are pretty zippy little things! 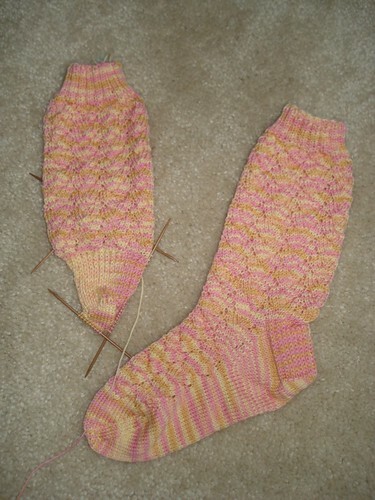 I'm past the heel flap and heel turn and have worked the first round with the gusset. I like the texture of the stitch pattern, but to me the stitch pattern area seems pretty wide (wider than a normal 64 stitch around sock knit on US 1's). 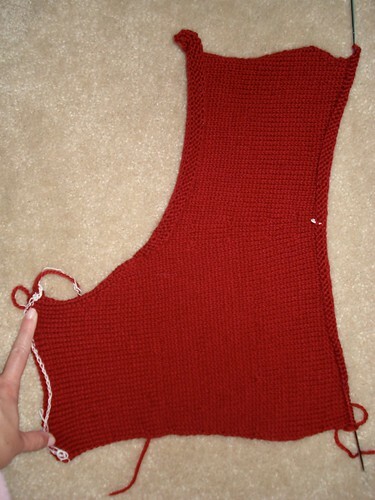 Because of this, I'm going to work the foot in stockinette stitch instead of using the Monkey stitch pattern. On a completely unrelated note (except it does have to do with knitting), I seem to have lost my mojo on the Cherry Blossom Shawl. I haven't worked on it in days, but yesterday I finally picked it up again and I've almost finished the first repeat of the last stitch pattern before the edge. (Does that make sense? I'm not caffeinated yet - as usual - so it makes sense to me, but I realize the rest of you are probably questioning the reasons I'm under the impression I should be blogging. Maybe this blog should be read by the uncaffeinated too!) 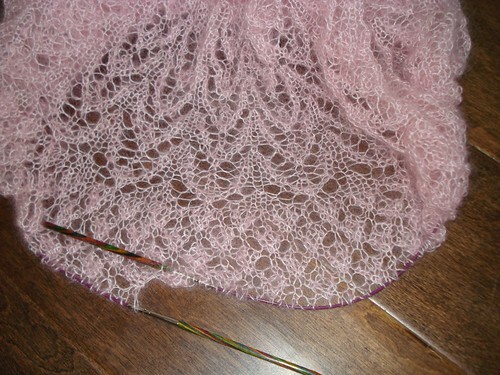 Anyway, I hope to get back to working on the shawl this weekend and maybe I can get it finished up. I don't really have a good reason for the loss of mojo, I mean I still like the design, I still like the yarn, I just haven't picked up the project. Have a great weekend! I'm off to make some tea now. We're gearing up for school around here. I have a pile of school supplies to double check against the list. Yesterday Caleb went to see the orthodontist for the first time and he's doing his first set of impressions next week to fit him for expanders. (Should be fun, he's got a hair trigger gag reflex and impressions can make anyone throw up. If he wants me in the room, I'll be behind him!) This morning we walked to school for the first time to see how long it takes. He's also got a check up at the pediatrician's next week, just to make sure he is growing right. Since he's grown 3 or 4 inches since January, I feel pretty confident that we're doing fine in that department. Then in less than 2 weeks, he's off to 3rd grade! 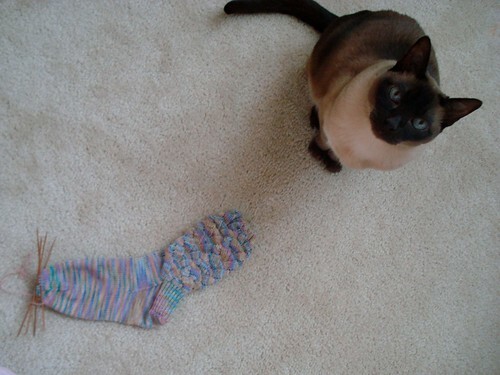 ...because that's what happens when you finish the last pair of socks. I've done Jaywalkers and enjoyed them, but had never done Monkeys. I decided it was time I had a pair of Monkeys! I drew out the chart on a note card to keep in my sock bag, but didn't write down the edging used in the pattern - and as I write this, I realize I still haven't checked to see how the edging was done in the original - so I just worked 5 rounds of K2, P2 ribbing to keep it from rolling without distracting from the Monkey stitch pattern. The yarn I'm using is Blue Moon Fiber Arts Socks That Rock Lightweight in Grimm's Willow Wren and I'm using my size 1's (US)/2.25 mm needles. It's a pretty easy pattern to follow and work, and as you can see, you get some really great texture in it's unblocked state. Thanks for all the support and advice and references for Ramius. I tried to find some information online when we first got the diagnosis and most of what I found was memorial sites to kitties who had died of kidney disease. Freaked me out quite a bit and put me off searching online for answers to my questions. I did interrogate the vet quite a bit and got my immediate questions answered, but now that you guys have given me some places to get more information, I'll dive back in and see what I can find. Thanks. As I mentioned in June, Ramius had his teeth cleaned. He is currently 14-1/2 years old. He's actually more active, pouncy and social since he had them done, which is a good thing. The day they cleaned his teeth they did a blood sample first to make sure he'd do OK with the anesthesia and when they did the sample, they found that his creatinine levels were higher than normal. Creatinine (not to be confused with creatine) at elevated levels can indicate kidney disease. I brought him back 3 weeks after the tooth cleaning to redo his blood tests and so they could get a urine sample to see if his kidneys were doing their job. (Creatinine can also be elevated from dehydration and stress.) His creatinine levels were down from the first test, but still above the normal range. His kidneys were concentrating his urine properly (still functioning right) and the two other markers for kidney disease in his urine that they checked for were within the normal range, although at the high end. This led the vet to the conclusion that Ramius has kidney disease, but we think we caught it at the very start. 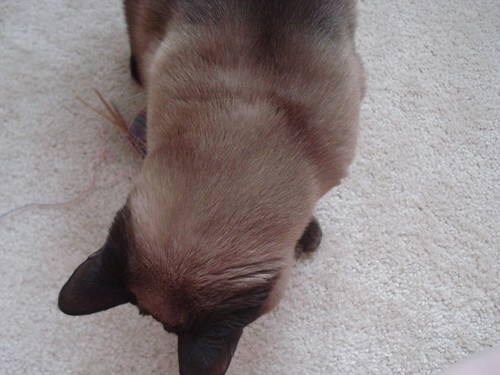 Usually when kidney disease is discovered because the cat has symptoms, the kidneys are mostly gone and the disease doesn't give the cat very much time. Catching it when we did with Ramius, before symptoms even showed up, and when it's just getting started means we could get him on a special low protein diet to make his kidneys' job easier. 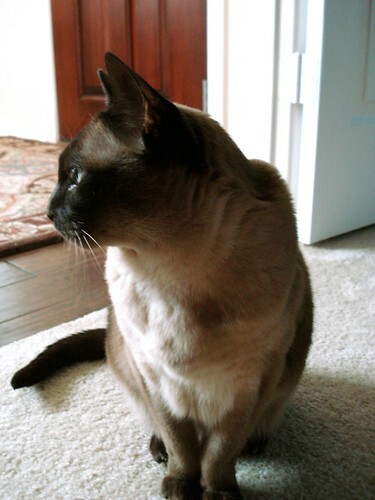 There's no cure for cat kidney disease, but it can be managed when you catch in when we did. He will have to eat this food for the rest of his life (he likes it - yeah!) and he will have to get blood work done every 6 months for the rest of his life to keep an eye on what's going on inside him, but if I didn't know what was going on, I would never guess that he was getting sick. He still pounces on wiggly toes under the covers, still jumps on counters he's not really supposed to be on, still lets us know when we've displeased him, still looks down his nose at Finn, and still begs for ice cream (now officially off the menu for him). I don't tell you all this to make you feel sorry for us, but Ramius always gets comments, both on the blog and from his pattern modeling. When I went to see the Yarn Harlot speak, I was as likely to get asked about Finn and Ramius as I was about Flamenco (which I was wearing). I don't let our personal life appear on the blog, but I felt like I should mention this now, rather than just letting you know at the end. I don't have any kind of potential timeline and honestly, I haven't asked either. They made it sound like we could manage this for several more years before things really start to go downhill. So this is what's going on. He seems to be feeling better than he was before June so that's a good thing, and we'll follow the vet's directions to help his body as much as possible from here on out. Thanks for listening. I'll have fibery stuff back tomorrow. Lorna's Laces Shepherd Sock in Winona. There's been a problem with the Autumn Leaves Cardigan. The problem actually began when I started the sleeve. Remember how I'm using more than one dyelot? 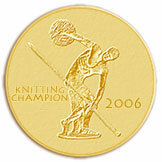 (Bad knitter, bad knitter.) Well I started with the smaller batch for the yoke and sleeves. 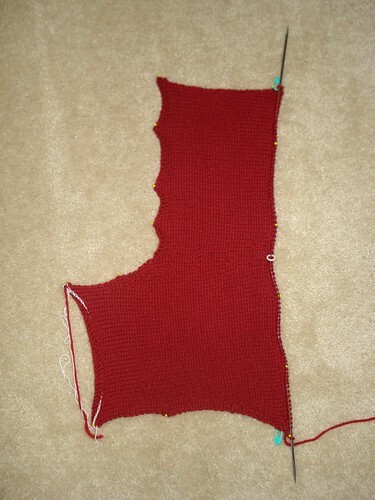 By the time I started the sleeve I knew I didn't have enough yarn in the batch to get that whole area done. Then I got a Ravelry message from the designer letting me know that she had clarified one of the steps in the directions. The way it was originally written, it could be worked one of two ways. I chose the wrong way. So, the dyelot issue and the fact that I'm going to have to fix what I already did anyway means I'm frogging it and starting over. Fortunately, I won't have to refigure row numbers for increases and decreases, I can just start over following my notes with the bigger batch of yarn. It should go pretty quickly for me to get back to where I was. So far, it's not a difficult pattern, but there have already been places where I'm working shaping in two different areas. I always work with a row counter, so when I get to these kinds of places, I can write down row numbers that each thing happens on. When I have two things going on at once, I make two columns and put the row numbers that I do each increase or decrease in it's column and then I can just double check the row numbers in the columns as I knit. It means stopping and making notes periodically, but it seems to be the easiest way for me to work. The notes also help me make right and left sections match. It's always nice when your right sleeve is as long as your left sleeve! I have been socking along! 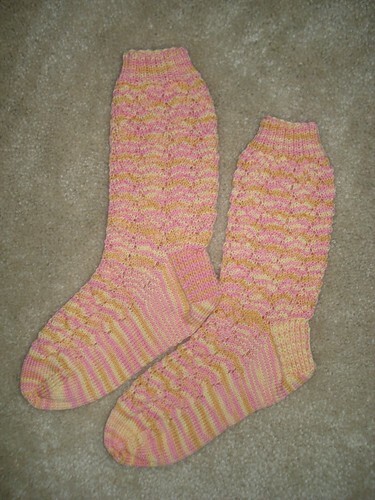 I finished the first Lorna's Laces Winona Lava Flow sock and I got started on the second. 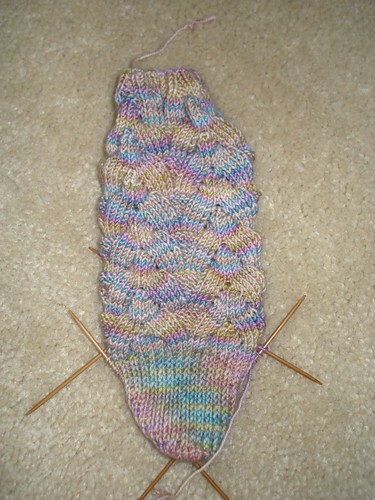 As you can see, I've done the heel flap on the second sock and I'm picking up gusset stitches. The second heel flap did end up with one side pink and one side yellow, but it's not as evenly divided as the first heel flap. 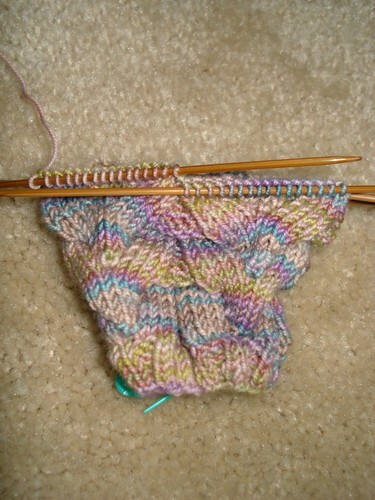 Still, I'm pretty happy with the heel flap pooling in this pair of socks.